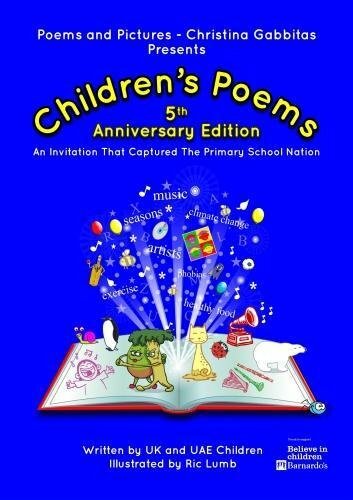 Way back in the early days of our blog we were pleased to feature the work of Christina Gabbitas - who established an annual children's poetry competition, and publishes an anthology of the best poems in the comp every year. The 5th edition has recently been published with the 6th edition coming up in March 2019. Gathering together poems of all shapes and sizes, subjects and length, from children in the UK and the UAE, it's a fantastic showcase of children's imaginations and a great insight into the sort of things that make modern kids tick. You can find out all about Christina's work (including a fantastic new initiative to talk about and tackle plastics in our oceans, a hot topic at the mo), and her own self-published titles over on the Poems and Pictures Website.